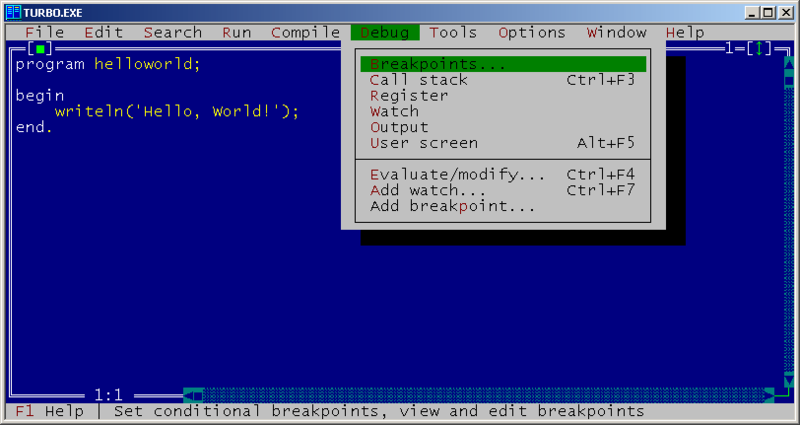 Graphical user interface library, with source, for Borland Pascal 7 and/or Turbo Pascal 7. Welcome to GraphVision version 2.01 (bugfixed) package! 1. GraphStaticBitmap.Done doesn't free memory. Fixed. 2. Push button's hot keys take no effect. Fixed. 3. SetExclusiveArea procedure doesn't work properly. Fixed. and it causes garbage on the screen. Fixed. 6. Screen scrolling sometimes crashes the program. Fixed. 7. A couple of little bugs in Geditors.pas were fixed. 8. TXmsStream.Truncate method doesn't work properly. Fixed. 1. Add the GraphVision unit directory name to the list of unit directories. - Do the same for BPC.CFG, if you have BP7. - start the TURBO.EXE IDE. Select the menu options: Options->Directories. - Do the same for BP.EXE IDE, if you have BP7. just copy the appropriate unit files to your work directories. Now go to the DEMO directory, compile the GVDEMO.PAS program and run it. describes the various units that make up GraphVision. variables, procedures and functions declared in each unit. including their fields and methods. Controls Tools and controls for use in dialog boxes. EventMan Mouse support, keyboard handler etc. GrApp Objects for applications building. GEditors Set of objects realising text editors. directories.Similar to TV StdDlg unit. use extended memory into applications. with videomemory and video hardware registers. fonts, as well as built-in BIOS fonts. monitor of events. This unit is similar to TV Drivers unit. of unit Grav from the unit Views are described. are similar to relative objects from Dialogs unit. For its complete description see "Turbo Vision Guide"
the elements to build a GraphVision applications. The unit GraMenu is analogue of unit Menus in Turbo Vision. This unit provides use of the pull-down menus and status lines. detailed description in a Turbo Vision manual. added to an object TFileDialog. products of Borland Int. for Microsoft Windows. The InputBox function is declared but does nothing. then closes all GraphVision subsystems. consisting an uniformly patterned rectangle. Defines drawing style for border of object GraphBackground. predefined in the unit Graph can be used. the pointer to it in the field Images. Draws a button on a screen depending on its state. draws on a screen an active button in a pressed state. This method can be overrided. The object GraphButton contains the same fields, as TButton. Their description see in " Turbo Vision Guide ". means that the element is labelled. Loads from the stream S a set of checkboxes. Destroys a set of checkboxes. determination and change of a condition of a current button. Adds a new checkbox in group of checkboxes. set in 1, i.e. the given checkbox is marked. Called from HandleEvent, when a checkbox is pressed. Changes value of field Value. Is never called directly. objects for checboxes and radio buttons are realized. Current chosen element of cluster. calling the method InsertItem for each element of list AStrings. descendants, which add other fields of data. overrided in derivated types, which add other fields of data. be redefined for descendants of the object GraphCluster. contex help for each cluster item. Returns the pointer to default palette. Abstract method, performing new item insertion in a cluster. AID - identifier of a item in cluster. Should be overrided for descendants of the object GraphCluster. be overrided for descendants of the object GraphCluster. GraphView.Store, writes Valuse and Sel in the stream S.
Creates object of a screen background. Called in the method GraphDesktop.Init. Can be overrided. This object similar to the object TDialog. Their description see in "Turbo Vision Guide"
entries in a window palette. several control elements in one group. Example of use: the unit Calc in the demonstration program. is never overrided and not called directly. also calledd. Is never overrided and called directly. Detailed description see in a manual on Turbo Vision. object THistoryWindow in Turbo Vision. Entries with 28 on 31 - color for GraphHistoryViewer. a manual on Turbo Vision. GraphLabel uses system font and size ofa symbol equal to 1.
to methods TListBox, except for the method GetText. The method GetItem is used instead. Returns untypized pointer to a Collection element Item. The object GraphListViewer is analogue of object TListViewer. each of them a method DrawItem. Abstract method. Returns the pointer to the element Item. have the image of the identical size. description of methods see in a manual on Turbo Vision. Search in a file of the executed program is at first made. Besides object of type TSharedResource is created. given in local coordinates of GraphProgram object. Is never overridedd and called directly. 1 - first button is chosen and etc. Creates a set of radiobuttons. Loads from the stream S a set of radiobuttons. Destroys a set of radfiobuttons. and change of a current button. Adds a new button in a set of radiobuttons. Called from HandleEvent, when a radiobutton is pressed. inserted in group. Is never called directly. transferred to it. Used as passive icon or label. Image pointer to loaded image. image, then loads image from file of standard resopurces. mentioned below, from the object GraphButton. Returns the pointer to palette of the text button CButton. of buttons with two fixed states. Establishs value of field Checked in true. Returns in variable Rec value of field Checked. Can be overrided for descendants. SizeOf(Boolean). Can be overrides for descendants. (if State and sfFocused < > 0). By default reads SizeOf(Boolean) bytes from the record Rec. Called by the procedure HandleEvent when button is pressed. Changes a valuse of Checked field, calling the method Toggle. Can be redefined for descendants. Sets the field Checked in the state CheckState. Calls GraphView.Store and writes Checked field in the stream S.
Changes value of fields Checked on opposite. Sets value of Checked field in false. realized for TScrollBar, are realized and for GraphScrollBar. The object GraphScroller is analogue of object TScroller. in " Turbo Vision Guide ". Returns scroller's sizes in logical elements. screen ( see the unit GFonts ). Defines the size of symbols text drawing on a screen. (analogue of the current pointer CP of unit Graph ). position of operation (for example WriteText). which global variable StdMouseCursor points to. Executes the same function, as similar method of TView. RealMove = true, a visible element is moved immediately. objects of a small size to avoid screen flicking. local coordinates of visible element. active (State and sfFocused = 0). Never override. For an example see the unit Arty. Restores the size of a minimum rectangle. Never call directly. procedure SetViewPort of unit Graph is called. It is not desirable to use this in other methods. in local coordinates of visible element. Draws a filled rectangle, using current color and pattern. Draws an image which Image parameter points to. given in local coordinates of a visible element. in PolyArray. A coordinate consists of TPoint object. central point and using current color. as a central point and using current color. Draws the filled poilygon using current color and fill style. PolyArray, which consists of TPoint object. using current color and style of a line. of field Cursor, up to the point Point. Makes Clipping on a bounds of visible element. EndAngle, using Center as a central point. on a bounds of the visible elment. Sets pixel given by Location to color Color. current color and line style. The object GraphWindow is analogue of object TWindow. In the realization GraphWindow small changes are introduced. combination of keys Alt-n ( n from 0 up to 9). In the field Flags three bit fields are in addition involved. Value of field Palette by default equally wpGrayWindow. execute any operation over these field is not recommended. Pointer to object " the working space " the type GraphGroup. ( see the method GraphWindow.Insert). execute any operation over these field. wpGrayWindow, creates and initializes the group WorkSpace. If the flag wfTitle is on, the window will have title bar. Adds a visible element in the window's working area. Main, light, dark for a inactive window. Background, text for a inactive window. designed for work with the 8x8 built-in font. of the table of images ATop in the field Top. The object TBGIFont is intended to work with standard BGI fonts. in the unit Graph or assigned by the function InstallUserFont. Calls TFont.Init and assigns AID to the field ID. BGI fonts do not change background pixels. from Graph unit, passing ID field as a one of parameters. This object is designed for work with built-in BIOS fonts. It inherits all the main methods of object TFixedFont. Returns value of field Bytes. graphics filter for Windows BMP files. in BP online help system. file information header to the Header filed. Reads the information headet of BMP file to Header field. Used to store any kind of data as a stream of bytes. The data size given in bytes. Pointer to data associated with object. pointed to by the Data field. The special case of object TBGIFont for DefaultFont font. redefined so that to emulate text clipping. bounds of the viewport area. using system font and current color. a element of the list. length but its width in pixels for current system font. various graphics data import/export filters. Pointer to the stream associated with processed file. Stores the status of last operation. See "Global reference"
giXXXXXX constants for information about status codes. Just calls TObject.Init and does nothing more. Can be overrided for TFilter descendants. to it into Stream field. It is an abstarct method which should be overrided. Reads the file header of graphics data file. Abstract method which should be overrided. Returns the sizes of image into ASize variable. Abstract method which should be overriden. there the datas from AImage^ image calling SaveImage method. Stores TFilter object into stream S.
Width of symbols in pixels. CharHeight values of AWidth and AHeight accordingly. Abstract type of any font. Contains the name of font. Calls TObject.Init and sets FontName to AName. pixels. TFont.CanFillBackground always returns true. The method TextWidth returns the length of line S in pixels. The method TextHeight returns the height of line S in pixels. the global procedure SetTextStyle (see "Global Reference" ). Returns a string with a font name. The TImage object is assigned to store an images of any size. Points to stream which holds an image data. then loads an image data using Filetr^.LoadImage(@Self) call. Saves an image into AName file using graphics filter AFilter. BitBlt parameter sets a write mode. and management with the mouse cursor. Holds the sizes of cursor shape. "Hot spot" coordinates inside mouse cursor. Points to mouse cursor shape. value to Size and HotSpot fields accordingly. AND mask and XOR mask. Deallocates memory used by cursor shape and calls TObject.Done. Changes the mouse cursor calling SetMouseShape procedure. kinds of raster fonts, including built-in BIOS fonts. Points to the table of images of symbols. image in the table of images. Number of character images in the table less one. Height of symbols in pixels. Returns the size of a image in bytes for the symbol Ch. Returns a pointer to the image of symbol Ch. This object is used by the object TSharedResource. use and name of the resource. This object redefines the methods FreeItem and KeyOf. which can be used by the several "customers" simultaneously. Returns number of loaded resources. zero, the resource is removed from memory. file, the Get returns nil. Returns the name of a resource with the index number I.
is defined for DOS real mode only. The size of stream in bytes. Creates a XMS stream with he given minimum size in bytes. of stInitError if initialization fails. Returns the current position within the stream. Returns the total size of the calling stream. starting at the current position. Top - pointer to the second half of the table (codes 128-255). Function Bits per pixel in one bit plane for current videomode. Function background style constants for GraphBackground object. Function Length of one scan line in bytes for current videomode. pixels. Tha Palette parameter is a color translation table. Outtext,OutTextXY,TextWidth) use this variable in their work. initialization and used by mouse cursor emulation routines. Function Destroys a collection of fonts. Function Closes the graphic subsystem. the background is filled in with the Back color. The drawing mode is determined by the value of variable Mode. Assumes that drawing symbol is inside screen area. Function Defines videomode for driver given by DriverType variable. initialization for required BGI driver search. StandardVGA - to use standard VGA. Vesa16 - VESA 16 color driver will be used. Vesa256 - VESA 256 color driver will be used. By default standard VGA is used. Function Mouse cursor emulation flag. drawing will be made by system mouse driver. Function Copies part of image from Source buffer to Dest buffer. is the same as GetImage/PutImage data structure. value for this variable. It is a code of one from "standard"
videomodes, supported by mouse driver. value $13 is used for VESA 256 color modes. address before mouse initialization. After "mouse reset"
is created by the procedure InitFonts. imported image' internal palette to the standard BIOS palette. Function Hot spot coordinates inside current mouse cursor shape. and adds this object to the font collection. Function Initializes graphics subsystem and sets up required videomode. message outputs to the screen and program halts. Function Disables the change of mouse cursor shape when not zero. Function Defines the minimum size of GraphWindow and its descendants. contain global ( screen ) coordinates. Function Points to current mouse cursor shape. Function Moves the block of pixels to a new location. Makes clipping on a current viewport boundaries. Assumes all coordinates are inside screen area. Function New flags for GraphView.Options field. ofNoDrawSelect View doesn't draw itself when becomes selected. ofResizeable View can change its size. ofMoveable View can be moved. Function Number of bit planes for current videomode. Sets up during videomode initialization. Function Points to the BGI driver registration procedure. Function Set by InitWideo to the screen width in pixels. Function Sets coordinates of disabled area for mouse cursor. coordinates of hot spot inside mouse cursor. Function Sets up the write mode for drawing operations. Mode variable used by some procedures from LowGraph unit. Points to collection of shared resources. Function Is set by InitVideo procedure during videomode initialization. if videomemory bank switching is necessary. Function Number of font in afont collection used as system font. status bar and dialog boxes. Function Returns the height of text for current font. Function Returns the width of text for current font. mode numbers for currently used BGI driver. Function Array of names for used BGI drivers. name of BGI driver for VESA 256 color modes is undefined. But you can use all avaliable BGI drivers for VESA modes. Function New masks for GraphWindow.Flags field. XMS memory was not initialized. variable holds an error code. Function Detects if XMS driver is present. and stores its entry point address into Xms_Addr variable. Function Xms_Initialized = true if extended memory manager is present. Function Returns the amount of all free extended memory in Kbytes. Source - 32-bit offset to first moved byte in source block. Dest - 32-bit offset in destination block. Count - count of moved bytes. Value of Count parameter should be even. descriptor. The Size parameter gives a new memory block size. Holds an exit code of last extended memory operation. Standard.rsc file, distributed with GraphVision package. resource file. A pointer to this file is called StdResource. therefore typecasting will be necessary. pointers are stored as object of type TMouseCursor. which allows to add a new resources to Standard.rsc file. any tools for its creation. editors which support this graphics data format. can be used with both 16 color and 256 color modes. of Windows bitmaps requires less disk space and loads faster. palette, their results sometimes may be inappropriate. close by standard BIOS colors for 16 color images. module with various configuration without recompilation. Vesa256 = 2 - VESA 256 driver. will set up required videomode using values of those variables. There are no problem with StandarVGA - EGAVGA.bgi will be used. between those logical drivers and real BGI drivers. driver, and Vesa256 driver - with SVGA256.bgi driver. to find the required BGI driver in program starting directory. specify the path to the directory where BGI driver can be found. numbers to real BGI driver modes is necessary. drivers and can be used only with real mode programs. and your mouse driver, try to turn mouse cursor emulation on. Don't change value of this variable during program execution! It may cause unpredicable results.